"Her beauty is timeless, her age is now. forever!" It seems like yesterday two sisters saw in their dreams a vision of Mardi Gras, with the beauty and grace that could only be captured in an all women's carnival organization. Thus, was this krewe born. A symbol was chosen for the power, dignity and beauty of a women's krewe... The ageless splendor of Egypt's mighty ruler... Cleopatra! In 2013, after 39 years of parading on the Westbank, the Krewe of Cleopatra moved her procession to Uptown New Orleans along the traditional St. Charles route. 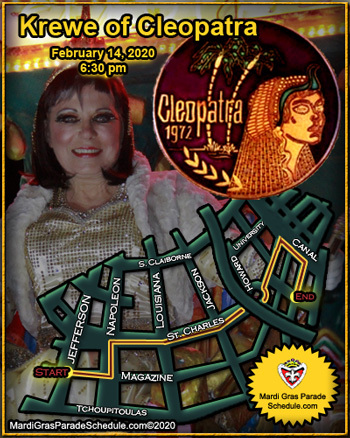 On February 22, 2019 at 6:30 PM, The Krewe of Cleopatra parade will start at the intersection of Napoleon Avenue and Perrier Street in New Orleans. The parade will proceed north until St. Charles Avenue, where the krewe will turn east. The Krewe of Cleopatra will follow St. Charles Avenue to Lee Circle, around the circle, and back on to St. Charles Avenue. The parade will follow Canal Street to Tchoupitoulas Street, where it will turn south. The parade will end at the intersection of Tchoupitoulas Street and Poydras Street.